Simple baby edit and lk posiedit. Nothing to say, just for fun! This is the time for a blacksmith edit! I hope that u like it!! 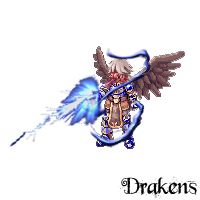 This sprite need a background, someone have an idea? I like how you used the valk helm on the shoulder pauldrons. hola, me da la imprecion que hablas español, verdad? Asd, I love this dragon, I give it a kind of grand peco's armour and the mutant dragonoid's wing. If you're saving these in MsPaint then save it as a png, gif or jpeg in mspaint is gonna ruin the quality. But since you can't use pngs on this site I suggest you search for some programs that can save as a gif without the loss of quality, there's a lot of free ware software that can save as gif (like some animators) that you can easily find by googling.